A few days before I attended the Edmonds sketch crawl, I was sketching in the area of Seattle's Yesler Terrace lo-income housing. 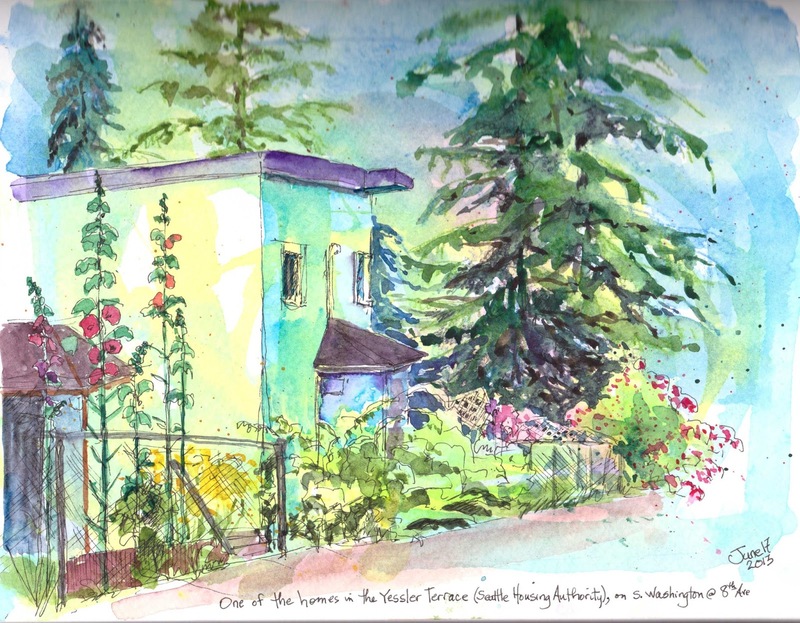 Four rather utilitarian homes faced into a fenced garden, while hollyhocks, hydrangeas and roses spilled onto the sidewalk, and of course, the I-5 freeway sounds were just the other side of some old deodor cedars. Always drawn in by the natural "embellishments" of a scene, I sat and sketched this scene. 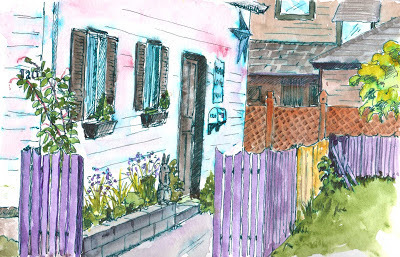 Then, at Sunday's sketch crawl in Edmonds, I wandered about the lovely downtown fountain area - so many picturesque scenes! - What to choose.... After 2 false starts with scenes involving the classic fountain, and also the bell in front of the Edmonds Museum, I found myself wandering the alleys of the downtown. I had been drawn in by the juxtaposition of several older homes, but then as I came closer to the home at 120, with it's purple fence of welcome, I knew I'd found my version of dwontown Edmonds! Love those shadows on the side of the building. Nice sketches, Peggy. I am fascinated by your tree and foliage sketches in all your paintings..your grandfather would be proud!